Urban farm. Credit: Trish Popovitch. More and more cities across the country are adopting urban agriculture ordinances to regulate and provide predictability and direction for urban growers. The move towards adopting local regulations for urban agriculture has not been uniform. Some cities face challenges passing and adopting ordinances while other find widespread support from citizens and state legislators and a smooth path to implementation. Santa Fe city officials say an urban agriculture ordinance is in the works, but the slow grinding of the city government wheel was too little too late for Gaia Gardens, the Santa Fe urban farm of Poki Piottin and Dominique Pozo that ceased operations in August in response to trouble with city inspectors, according to a report in the Albuquerque Journal. The pair had advocated for change through battles over water, zoning and calls by neighbors for their farm stand to be closed. Exhausted and disillusioned, the farmers stop fighting and closed their farm. But despite bureaucratic bottlenecks slowing the pace of adoption of an urban agriculture ordinance in Santa Fe’s, other cities are moving forward. Drought in the sunshine state has not stopped the progression of urban farming. Since the passage of California’s Urban Agriculture Incentive Zones Act (Assembly Bill 551) in January of 2014, urban farming has enjoyed firmer footing along the west coast. 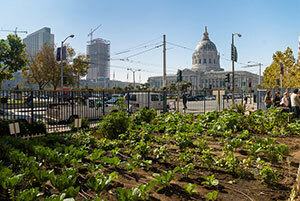 Last year the cities of Oakland and San Francisco added to their existing farming regulations and programming. In June of this year, Santa Clara County adopted the Urban Agriculture Incentives Zones Act for their jurisdiction, creating an urban farm tax incentive for property owners in 13 cities and towns amounting to over 1000 eligible properties. Proposed ordinances are under review in Richmond and Encinitas. Sacramento passed an urban agriculture ordinance in April of this year. It’s not just California that has enjoyed widespread support for urban farming. In Boise, Denver and Kansas City the urban farm is now established as a permitted land use. Sustainable agriculture ordinances have recently passed or been updated in Atlanta (June 2014) Dallas (February 2015), Pittsburgh (July 2015), New Orleans (August 2015) and Winston-Salem (May 2015). As urban farming spreads, data on the movement grows. The Design Trust for Public Space is a New York-based nonprofit that works with city government and other organizations to study, determine and implement sustainable urban planning. In 2013, Design Trust created a metrics framework that demonstrates the benefits of urban agriculture. Combining economic, ecological and health data from several surveys, Design Trust’s framework is a tool for showing elected officials the positive effects of implementing an urban agriculture plan using indicators like reductions in obesity and diabetes rates, and decrease in carbon emissions. Cities including Tucson, Knoxville and Morgan Town , W.Va are in the process of revising town zoning ordinances. Even in areas with well-established urban farming regulations, progress continues. Chicago recently adopted changes to expand composting regulations. The city of Portland has had a community garden ordinance since 1975, but added an Urban Food Zoning Code in 2012 to address urban farms and gardens. The issue of urban livestock is one reason city councils might be hesitant to adopt urban agriculture legislation. Livestock training fees, animal certification costs and neighbor complaints are real issues for many communities. In Spokane, WA, it was determined that the city would have to hire additional animal control staff to enforce their April 2014 urban agriculture ordinance. Spokane Council President Ben Stuckart considers the cost: “a small price to pay for food security.” Excluding animals from the argument has caused issues in Detroit and Flint and delayed the passage of legislation in Encinitas. Rural areas of the country are also making changes. Wyoming’s recent passage of the Food Freedom Act increases public food choices and supports local farmers. A seed library exemption to the commercial seed law in Nebraska passed in 2015. And despite the green media backlash against Santa Fe, 2015 will mark the third year of the annual New Mexico Organic Farming Conference. State-level sustainable urban agriculture legislation is on the rise, a move that will likely grease the wheels for more local action. With a few hiccups, support for urban farming through local ordinance continues to grow.